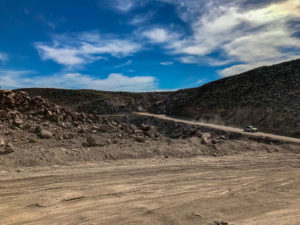 Discussion in 'Baja Bytes By Gary Graham' started by Baja Bytes, Nov 12, 2018. Striped marlin are at the top of the heap this week with double digit-releases at both Magdalena Bay and down the Pacific side closer to Land’s End at the Finger Bank. Second to the top would be wahoo at Magdalena Bay where limits are common right now. Beyond that Ensenada, Loreto and East Cape are still enjoying the last gasps of the great fall season that was enjoyed this year. 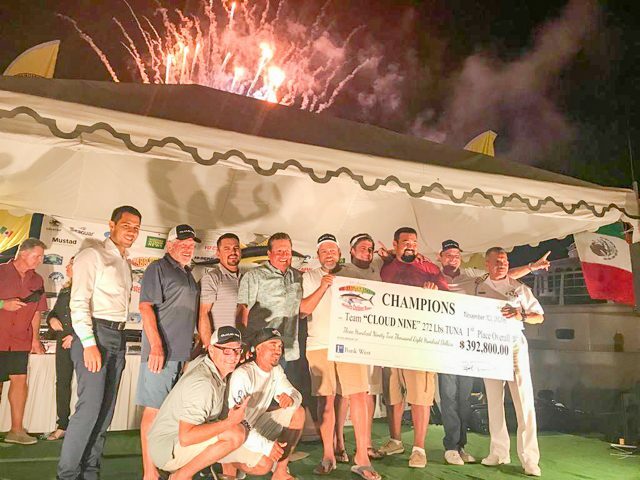 Saturday evening saw the conclusion of the 20th edition of the Western Outdoor News Jackpot Tuna Tournament which was a fabulous event and featured the second highest ever number of entries at 163 boats. The field ranged from pangas, to standard charter boats, to sleek 80-foot Vikings. The action was fast and furious the first day and slightly slower the second; nevertheless there was some great action and several fish over 200-pounds. As usual there was last-minute drama each day which added to the excitement of the tournament. 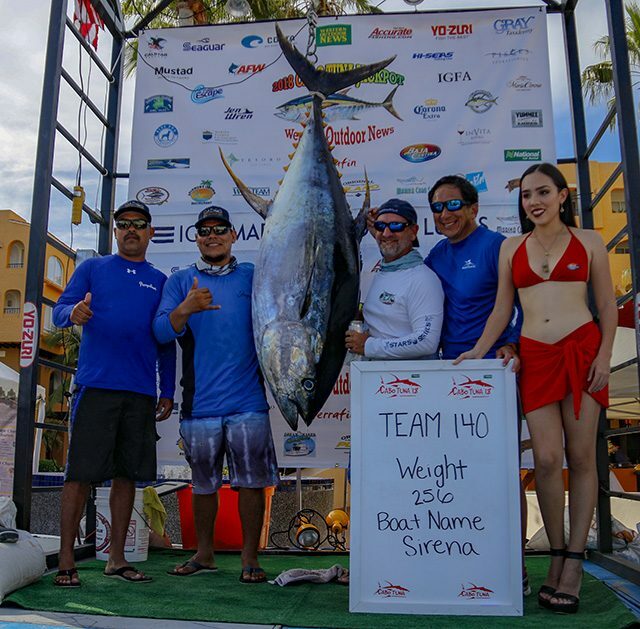 The first fish to be weighed in was by Pisces La Brisa, a respectable 158.9-pound tuna that stayed in first place for half an hour, until team Sirena pulled in aboard their center console Contender and unloaded a fresh-looking tuna that had only taken John Dominic 20 minutes to land and that tipped the scale at 254-pounds – this well-known local team is well respected and fish hard – they were across the board and as other fish came in throughout the afternoon none were able to knock this fish out of the number one spot. Team Cloud Nine called in to say they were having transmission problems, and didn’t know if they would make it in by the 6:00 p.m. deadline. Greg Lewis, the angler, has been fishing Cabo since he was a little boy; this year he finally achieved his dream of owning his own boat, a 60-foot Bertram. Greg wisely hired “Perico” as captain. 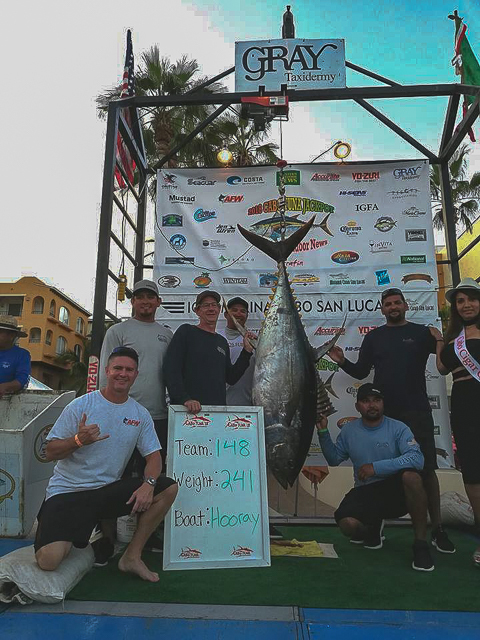 Perico currently holds the record for captain of the biggest tuna caught in this event — a 383-pound fish caught back in 2009. The crew worked miracles, and the boat made it in with just ten minutes to spare. This allowed them to hang their fish which registered at 272-pound making them the Day One winners. As if this was not enough, they weighed a second fish that was 230-pounds! The first day wahoo was by Team Wahoo aboard Make My Day, a 43.3-pound fish. Second day saw more nice fish coming to the scale with several weigh ins, but gasps erupted from the crowd when Bad Medicine unloaded their fish onto the dock – it was big – 266-pounds to be precise; but they were not entered in any jackpots, meaning their winnings would be reduced dramatically. Next nice fish was by Team Hooray and these guys were across the board, meaning their 241-pound tuna could be worth a lot of money. We heard from Team Tejas headed up by Mark Darden, that they had a big fish but had engine trouble and they were still miles away. These guys are professionals and always seem to bring good fish to the scale; however, the tournament rules are enforced and the boat did not make it to the dock until 6.03 p.m., which was a tragedy … they weighed their fish anyway and it was 262-pounds; they would have taken over $300,000.00! Second day wahoo was 57-pounds by Texas Tuna Ticklers aboard Blue Marlin. No luck in Point Loma Kelp or Upper Nine, hit South side of Zuniga Jetty at mid-point around 12:30 p.m. Drifted from jetty South to moorings several times with reverse dropper loop and 3-oz. torpedo with live belly-hooked sardines. We got two short halibut and two 23-inch keepers by 2:30. The yellowtail bite is slowing down. Only a handful of them were caught yesterday among 3 to 4 sportboats. The main zone is still around 32 26-27 x 117 17 but you may also find an occasional yellow along the weather side of North Island and around the Middle Grounds. Plenty of bonito around if you want them. Weather side of North Island, Middle Grounds and Ribbon Kelp have lots. With so few boats fishing the Islands, reports are very hard to come by, so if you fished the Islands please shoot us a report — [email protected]. Same as above. Season is winding down. Still some skipjack and some kelp paddy yellowtail if you are lucky, but for sure the volume is shrinking. There are a few kelps in this area holding yellowfin but they are drifting fast to the south. Cristian Catian with another yellowtail caught just now out on the highspots! place. Everyone was pretty much in a food coma today. I included a few photos of the preparation process. Noteworthy to me is the way they prepare their lobster. 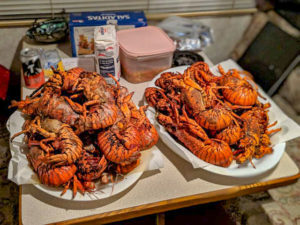 It really goes against everything I know about cooking lobster. BocanaAdventure y Juanchy s Art Nov.06 2018……Estero de La Bocana,BCS…Cap.Dago Lopez….para mis Amigos de PURA VIDA…….Info.6151591754 y 6151099512…….Juanchys Pics. Just got back Tuesday … 10/30. Towed my 21-foot boat down but decided to leave it there instead of dragging through the detours. Like someone mentioned, the detour that goes under a bridge is pretty gnarly. Trucks were stuck at the bottom from Saturday till we passed through on Tuesday. If towing anything, 4-wd is a must. It’s the best time of year to be in Baja! The cold north winds are a few more months away and the water is still warm enough to hold dorado in good numbers, although the biggest “hold” for the dorado must be the amount of live bait in our local waters. Sardina are in enormous schools everywhere you look and that makes bait catching a sure thing. And there are roosters circling below! 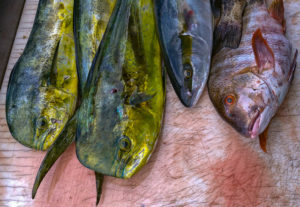 Dorado and sierra are the favored catch in the open channels with some cabrilla, firecrackers and pargo filling in around the rocky points close to shore. Dorado sizes have been varying from day-to-day with today’s catch being half the size of yesterday’s 36-inch versions. fuller. Take two and you will need a bigger box. Mag Bay Outfitters is keeping busy putting fly fishermen on marlin — and small yellowfin are available if you don’t want to make the long trip from Lopez Mateos out to the Ridge. Bait suppliers were working overtime trying their best to find enough resources for all the fishing charters. Sardina have been scarce the past few weeks. Schools of these baitfish are now being found off the Chileno area in limited quantities, though they are smaller than average size. Supplies of giant squid slabs have run completely out in recent days, waiting for new shipments to arrive. 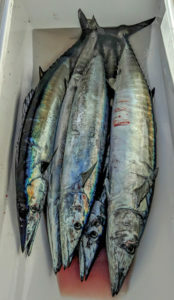 Caballito are being netted inside of the PLC marina channel and numbers seem to be holding up okay; ballyhoo is another bait being offered — rigged for surface trolling, they are special for dorado, wahoo and billfish. Small-sized skipjack on the offshore grounds have been used for the larger gamefish. Also some chihuil are being found on high spots, though it’s time consuming to try and catch these candy baits. 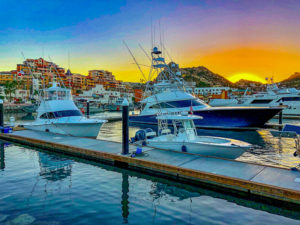 Most charters from Puerto Los Cabos Marina are now concentrated on the Iman, San Luis and Vinorama Banks, though there has been a percentage searching out the waters off Santa Maria and Red Hill. The highlight for most common catches has been the yellowfin tuna. Overall action has been hit and miss, lots of pressure day in and day out; at times bait shortages as well. 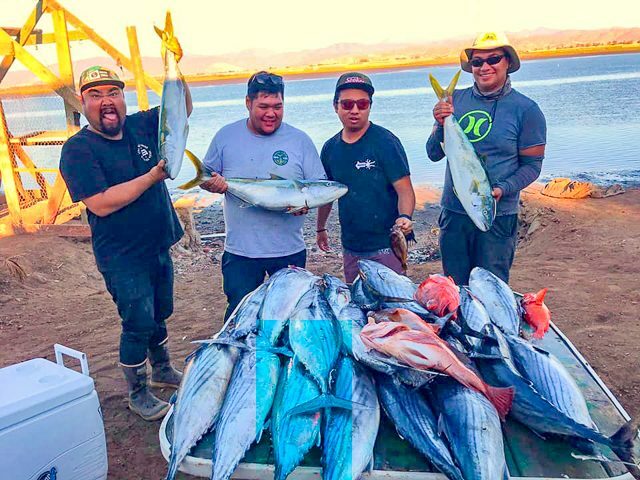 Best chances seemed to be early morning on the San Luis Bank, drift fishing squid, slow troll skipjack, caballito or chihuil — all produced a quality grade of fish, not in big numbers, but fish in the 10- to 80-pound class were most common. 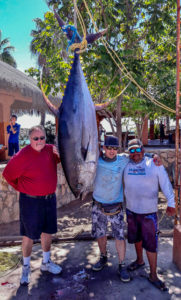 The largest fish of the week was caught aboard the super panga “Killer II,” with skipper Chame Pino, anglers Craig Kojima and Steve Terp teamed up to battle the super-cow which was weighed in at 302.5 pounds which was the largest tuna we have seen weighed at our dock area this season. 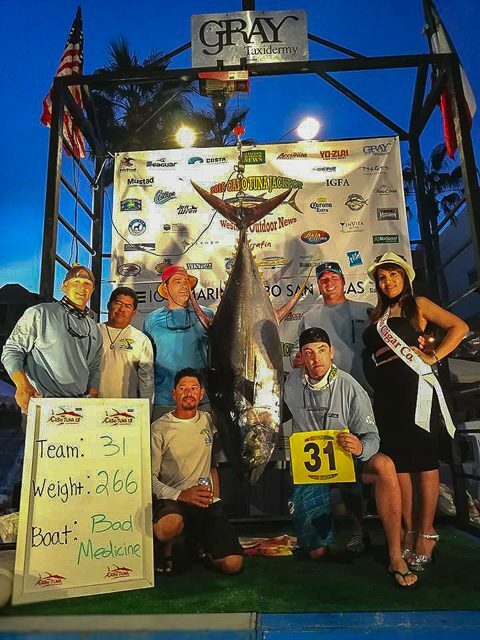 At least a couple of tuna in the 250- to 270-pound class have been found on the Gordo Banks during the recent tournament. It’s encouraging to see the “cows” moving in finally! We have not seen numbers of these giant tuna on these grounds yet this season. Warm water temperatures should help keep these fish in the region later in the year. The overall action for yellowfin seemed to have been more consistent early in the week, progressively tougher as the week progressed. Heavy pressure on these grounds can make fish spookier. Many more dorado are being landed. These fish were found closer to shore, such as off Palmilla Point or Punta Gorda. Once schools were located, they would readily hit various bait, especially the small caballito. There were a handful of larger ones to 25 pounds. 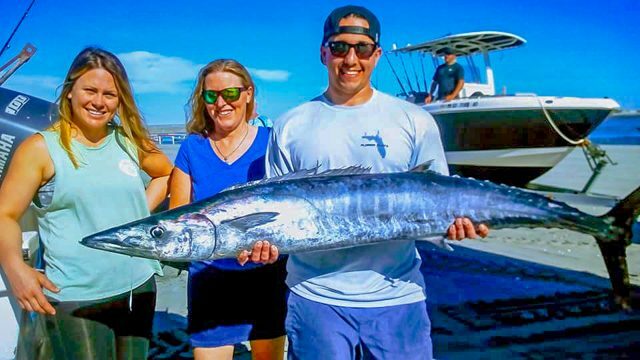 Wahoo action was hit and miss, though these fish are still in the area and we are seeing some of them caught every day — some days many more than others. These fish seem to be the wariest of heavy boat and angler pressure. Wahoo were striking on lures and bait, but bait seemed to produce greater chances, sizes up to 45 pounds. Anglers were doing well to land a couple of wahoo as they are an elusive species and highly sought after. Minimal bottom action with bonito and triggerfish being the main catches. Tough earlier in the week — there was one 65-pound amberjack landed, plus a few nice cabrilla and snapper. That’s a wrap for the 2018 Tuna Jackpot down here in Cabo. As always Tuna fishing out of Cabo San Lucas is full of surprises. 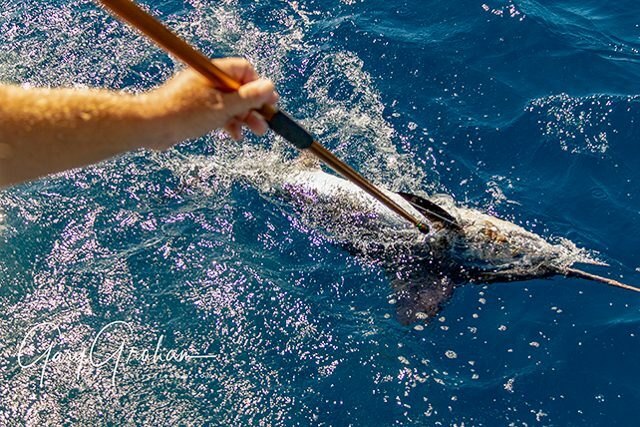 The Striped Marlin fishing has continued to improve with overall offshore fishing continuing to be productive with solid catches of sailfish, blue marlin, and a few blacks showing up. The fleets have reported consistent blue marlin activity along with some sails and more and more striped marlin as the Pacific waters begin cooling. 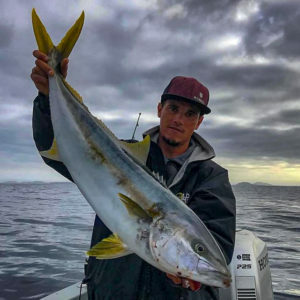 The yellowfin were a bit spotty this past week after several commercial seiners showed up recently, mostly showing in the 20- to 25-mile range out toward the San Jamie — most were averaging in the 25- to 30-pound range. 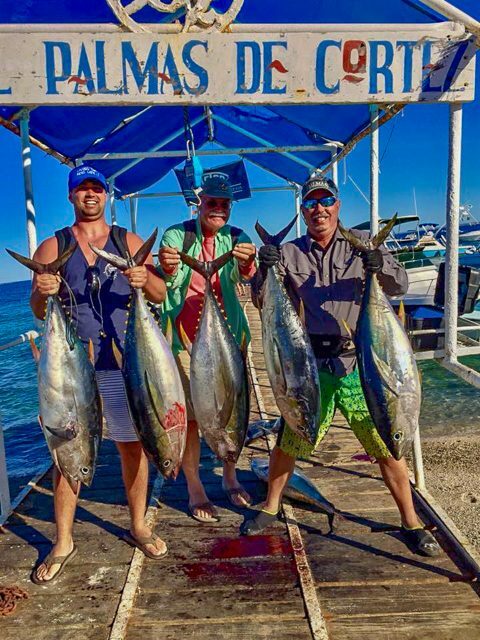 The dorado fishing picked up again with mostly mid-size fish showing. Most of the blue marlin are running in the 200- to 300-pound range with more blacks showing up around the corner to the East than in the Cabo area. Wahoo were spotty but improved closer to the new moon – downriggers with Rapalas produced the most action. Inshore fishing has continued to produce nice catches of smaller dorado and schools of skipjacks with the sierras have started to show as well. Cabo Climate: The month started with very pleasant weather and mostly sunny to partly cloudy skies with average daytime temps in the upper mid-80s and evenings in the mid-70s. The two-week outlook is for more of the same. The good news is there is no rain forecast through the Thanksgiving holiday weekend and winds are expected in the gentle 7- to 9-mph range. Humidity is expected to run in the mid- 60s range until the end of November. Sea Conditions: Seas have been relatively calm in the mornings throughout the area with some swells showing up in the afternoons. Forecast is for more of the same with winds in the 7-9 mph range out of the WSW and WNW. Sea temps are running from 79- to 81-degrees (Pacific) and 80- to 83-degrees around the inside corner to the Gordas. Best Fishing Areas: The hot spots seem to be shifting from the 95 and 1150 Spots to the west and north. Good counts of marlin are showing up around Cabo Falso and the Lighthouse and out to the San Jamie bank. Sailfish and striped marlin counts are good in the Migrino area and the quality dorado seem to have moved north along Migrino as well. The yellowfin are being found 15- to 25-miles out from the Herradura west to the San Jamie Bank. For those willing to make the longer runs, the Finger Bank has started producing multiple striped marlin counts with a few boats reporting over 20 fish per day. Traffic is light up there competing for increasing numbers of migrating striped marlin. Bait Supply: Live bait is available at the $3.00 per bait upon exit from the harbor. With recent tournament action and an increase in seasonal traffic quality live bait has become scarce at times. Tunahead and mulegemike like this.